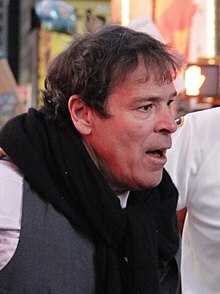 Randolph A. Credico is an American perennial political candidate, comedian, radio host, activist and the former Director of the William Moses Kunstler Fund for Racial Justice. Credico was once active on the comedy circuit, and at the age of 27 he made an appearance on The Tonight Show Starring Johnny Carson. During the appearance, he criticized U.S. foreign policy and compared Ambassador Jeane Kirkpatrick to Eva Braun; Credico was not invited back to the show, and some[who?] believe this is due to the Kirkpatrick impersonation. He was featured on the 1988 comedy album, Strange Bedfellows: Comedy and Politics along with Jimmy Tingle, Barry Crimmins, and Will Durst. Credico spent four years in Tulia, Texas, bringing national attention to a racially charged mass drug arrest. The Kunstler Fund produced an award-winning documentary on the subject entitled Tulia, Texas: Scenes from the drug war, written, directed and edited by Emily Kunstler and Sarah Kunstler, the daughters of famed attorney William Kunstler. Credico is the subject of the film Sixty Spins Around the Sun, directed by comedian Laura Kightlinger. Credico produced, directed and wrote the radio program 60 Mimics, and is a frequent guest on Live from the State Capitol with Fred Dicker, a political talk radio program on WGDJ in Albany, New York. At age 37, Credico began a periodic campaign against New York state's Rockefeller drug laws, which he claimed were too harsh, disproportionately affecting the poor and minorities. Small changes softening the stiffest penalties were passed in the state legislature, which Credico thought were insufficient. In 2010, Credico attended a meeting of the New York State Senate on Open Government dressed as the Greek philosopher Diogenes the Cynic, "seeking an honest politician." In the early 2010s, Credico became a perennial candidate for political office. Credico's most notable appearance in the 2016 election cycle was headlining a Republican fund-raiser in Cayuga County, New York. Credico ran as a Democratic primary challenger against Senator Chuck Schumer in 2010. Credico submitted petitions in an effort to get onto the Democratic Party primary ballot. The party chairman claimed that Credico only submitted a few pages' worth of petitions to the state, far short of the 15,000 necessary, a charge Credico denied. Credico threatened to throw his support to Republican candidate Carl Paladino in the gubernatorial race. He made the ballot. Credico's campaign was supported by several actors and comedians, including Seinfeld co-creator Larry David, Roseanne Barr, and "Professor" Irwin Corey. He was nominated by the Libertarian Party of New York and the nascent "Anti-Prohibition Party" of Kristin "Manhattan Madam" Davis, though those parties do not have permanent ballot access and were required to petition their way onto the ballot. Credico finished with 25,975 votes (0.6%), in last place among the four candidates; in most jurisdictions, Credico was only given one ballot line despite petitioning for two. Credico sued the New York State Board of Elections under the Equal Protection Clause of the Fourteenth Amendment over this issue of ballot access. On June 19, 2013, the Federal District Court for the Eastern District of New York ruled in favor of Credico. The New York State Board of Elections did not appeal this decision. Credico ran for the Democratic nomination for Mayor of New York City in the 2013 election. He received 12,685	votes (2.0%). He also appeared on the ballot in the general election with 14 other candidates, on the Tax Wall Street line, receiving 654 votes (0.1%). Credico challenged incumbent Democratic Governor Andrew Cuomo in the 2014 Democratic primary. He came in third among three candidates, with 20,760 votes (3.6%). On August 27, 2016, Randy Credico sent a text message to Roger Stone that "Julian Assange has kryptonite on Hillary." Credico also notified Stone of subsequent releases by Wikileaks of numerous emails stolen from Podesta and the Hillary Clinton campaign, a publication which initiated on October 7, 2016. In November 2017, Stone told the House Intelligence Committee that Credico was his intermediary with WikiLeaks founder Julian Assange to obtain information on Hillary Clinton. Credico was then subpoenaed to appear before the committee, but asserted his Fifth Amendment right before the interview. The committee released him from appearing. By August 2018, special counsel Mueller had subpoenaed Credico to testify before a grand jury in September 2018. Credico intended to comply with the request. Mother Jones reported that Credico had received text messages from Roger Stone in January 2018 stating that Stone was seeking a presidential pardon for Assange. In January 2019, the FBI arrested Roger Stone. Stone's indictment claimed that Credico, referred to as Person 2, was not Stone's sole contact with WikiLeaks (Organization 1). It also claimed that Credico was pressured by Stone to "stonewall" his testimony before Congress, and to "do a Frank Pentangeli." Among other statements, Stone told Credico to "prepare to die," and that he would "take that dog away from you." Mr. Credico relies on a medical support dog. ^ "William Moses Kunstler Fund for Racial Justice". www.kunstler.org. ^ Kilgannon, Corey (November 16, 2009). "Drug Activist Leaves Kunstler Fund for Senate Bid". The New York Times. Retrieved January 25, 2019. ^ "Albany Watch Blog". Poughkeepsie Journal. June 12, 2016. ^ "Political satirist Randy Credico to headline Cayuga County GOP fundraiser July 29". The Citizen. Auburn, New York: Lee Enterprises. July 17, 2016. ^ Katz, Celeste (July 18, 2010). "NYS Dems Party Chair: Randy Credico & Co. Fail Petition Test: Update". New York Daily News. Archived from the original on July 21, 2010. ^ "New York Libertarian Party Wins Lawsuit Against Discriminatory Election Law - Ballot Access News". www.ballot-access.org. ^ "New York State Changes Mind, Won't Appeal Credico Decision - Ballot Access News". www.ballot-access.org. ^ "2013 New York City Primary Results". The New York Times. September 16, 2013. ^ "New York City Mayor - 2013 Election Results". The New York Times. November 6, 2013. ^ a b Schecter, Anna (November 14, 2018). "Exclusive text messages show Roger Stone and friend discussing WikiLeaks plans". NBC News. Retrieved November 14, 2018. ^ Raju, Manu; Herb, Jeremy (November 29, 2017). "New York radio personality was Roger Stone's WikiLeaks contact". CNN. Retrieved December 26, 2017. ^ Friedman, Dan (December 13, 2017). "Roger Stone's Go-Between With WikiLeaks Takes the Fifth". Mother Jones. Retrieved December 26, 2017. ^ Murray, Sara (August 10, 2018). "Mueller subpoenas Randy Credico, who Roger Stone says was his WikiLeaks back channel". CNN. Retrieved August 10, 2018. ^ Friedman, Dan (October 25, 2018). "Text Messages Show Roger Stone Was Working to Get a Pardon for Julian Assange". Mother Jones. ^ Mazzetti, Mark; Sullivan, Eileen; Haberman, Maggie (January 25, 2019). "F.B.I. Arrests Roger Stone in Mueller Case". The New York Times. Retrieved January 25, 2019. ^ "U.S. v. Roger Jason Stone Jr: the full indictment". The Washington Post. Retrieved January 25, 2019. This page was last edited on 6 March 2019, at 01:32 (UTC).